Tell a story with your table! One of the best ways to make a guest feel welcome at a party is to set a thoughtful table. Fancy or casual, considering a few details can take your event from basic to wow! 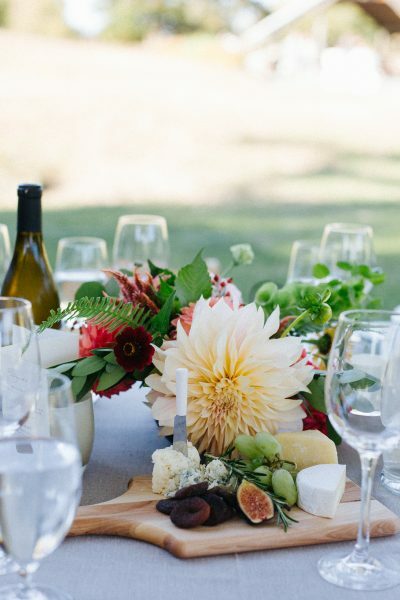 You don’t have to get fancy or spend money…you don’t even need a floral centerpiece! It’s not about the money, but the creativity and care. Thoughtful is more important that perfect. Your guests will feel your intentions, and that will enrich their experience. 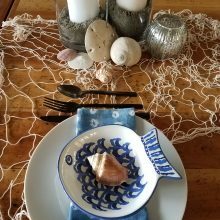 Just consider these ideas when you set your table. 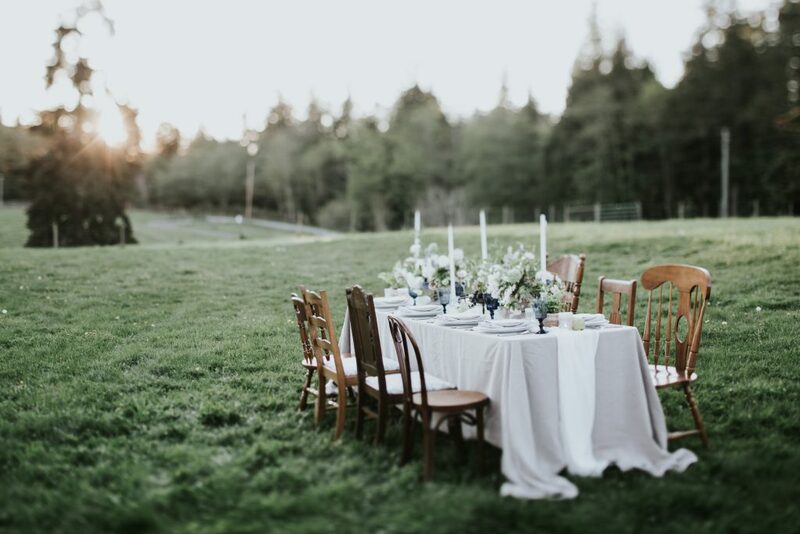 Think of your overall table – both place settings as well as centerpiece – as the story of the event ahead. 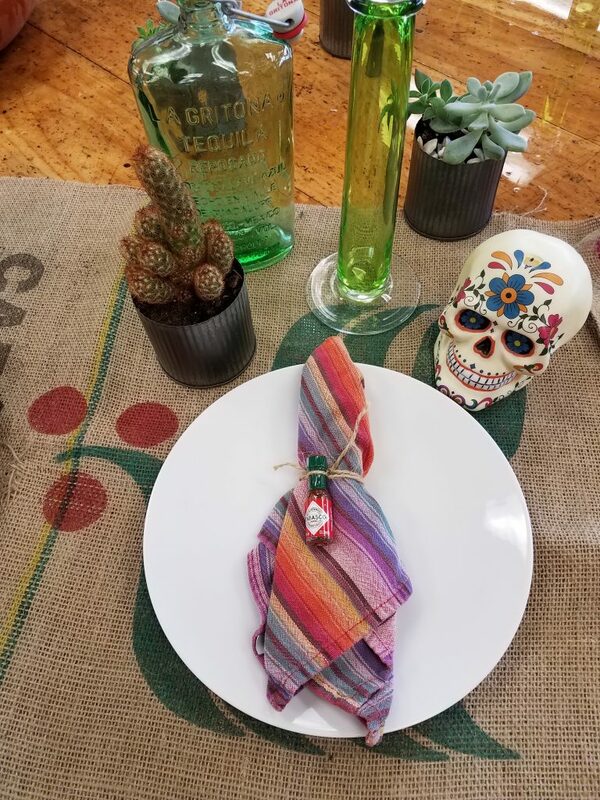 This can pertain to the theme of the meal – Mexican, Moroccan, etc; or to the setting or feeling – beach, garden, romantic. Include elements that speak to the feeling or colors of your theme and let the table introduce, reinforce or tell the tale. Below, the settings are themed Garden, Beach, Asian Fusion, and Southwest. None of these are fancy or complex or expensive to create. They all are created from elements most people would have easy access to. But all of them convey the theme, and would put the guests in mind of an “elevated” environment. 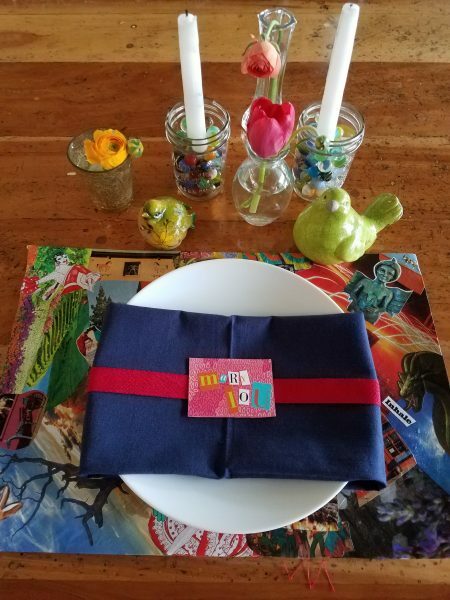 Include at least three layers, and the table/tablecloth doesn’t count! This creates depth and adds interest. 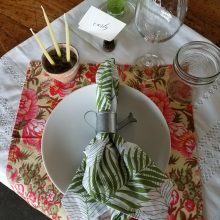 Just like a great outfit needs more than pants and a blouse, a nice tablescape benefits from not just a tablecloth and a plate, but accessories like a nice napkin, a placecard or menu, a personal centerpiece, or little touches like an herbal sprig, a blossom, a personal tabasco sauce, etc. Note 3 layers in the picture above: rattan charger, napkin, and a groovy menu (and placecard) by Grey & Cake. Floral design by Tobey Nelson Events; event design by Taylor'd Events for Within Sodo wedding show. Image by Laura Marchbanks. Cross the knife and fork on top of the plate. Fold the napkin into an interesting shape, or place it at an angle. Put all the silverware above the plate. I doubt Emily Post is invited, so throw conventions to the side and do something different. Different equals memorable! Play! 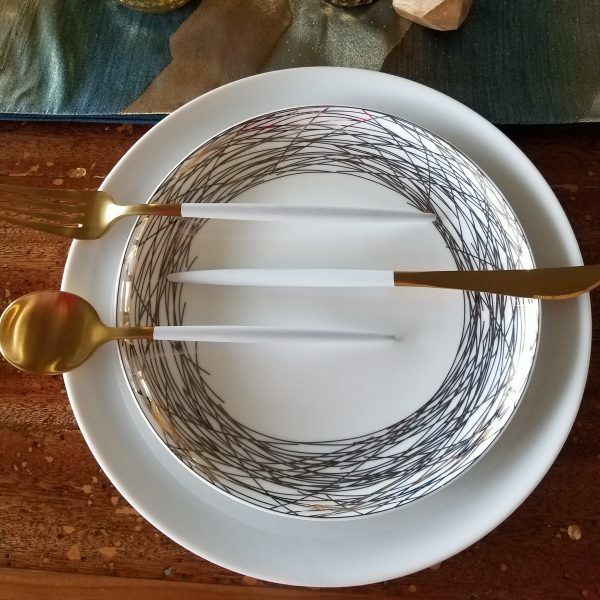 Try out a twist: cross the silverware! Put the napkin at an angle! Put all the silverware above the plate! Bring something of yourself to the table. If you are known for a certain style, color, or collectible – include it! If you collect glass floats, include some of them in the center of the table. If your favorite color is blue and you always wear it, get blue paper and a metallic marker and draw up some name cards or menus. If the party is for your husband’s birthday, and he builds model cars, why not include car parts or the finished vehicles as part of the table settings? 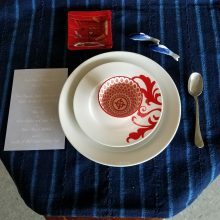 Never miss a chance to make a personal connection during an event; it will lend such a “real” feeling that your guests will truly appreciate. I love color & collages. 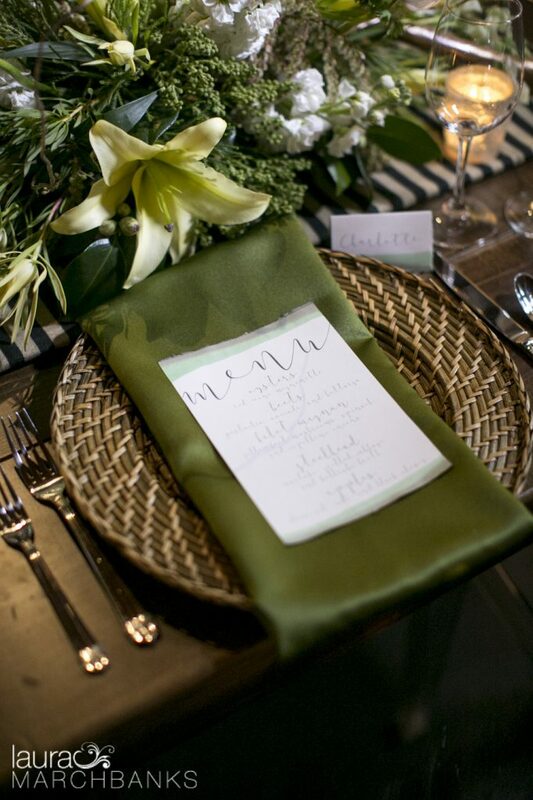 To add a personal, arsty touch to a whimsical event, I created placemats and placecards. This is a no-expense, unique touch that makes the event unique. Candles are held in place by marbles I have collected over my years of gardening. Every marble in those jars was dug from a project – none were purchased! Use your creativity to bring a unique signature to your event! 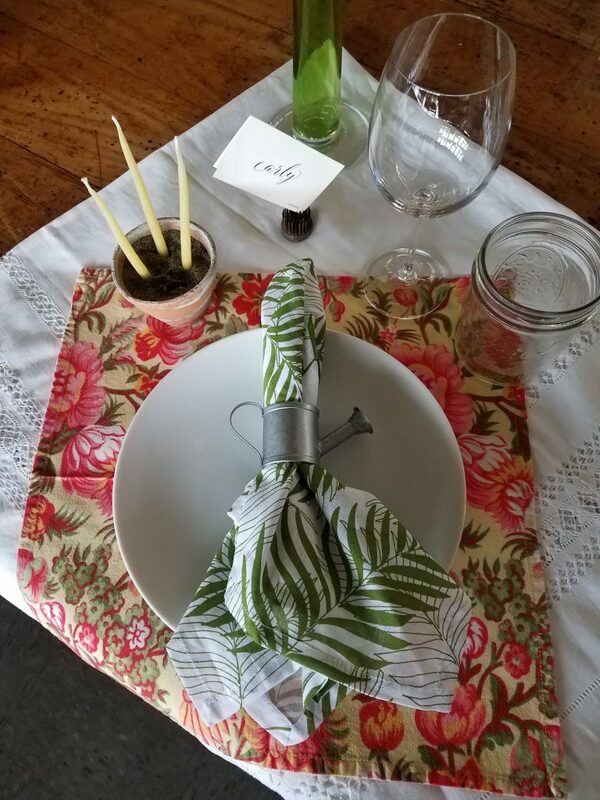 Use components from the meal as the centerpiece. Display colorful spices, beautiful veggies or fruit instead of flowers. 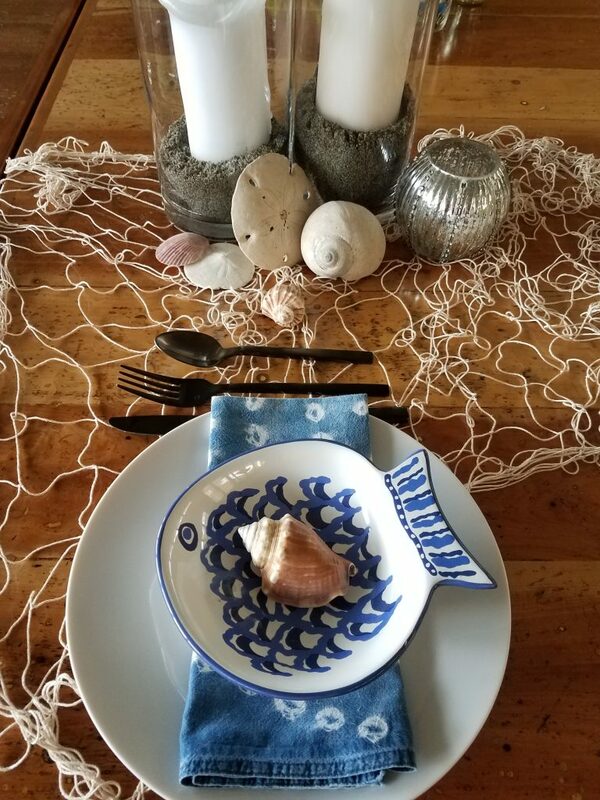 Or preset part of the meal on your table as a decorative element. A beautifully laid platter of crudité, fruits, or even a plate of crackers with an opened bottle of wine – all those things have their own beauty, and can signal “welcome” to your guests, and be a little bit of foreplay for the event ahead. Take your dining out of the dining room - move the table into the living room and dine in front of the fireplace, or out in the orchard. Be playful with your placecards. Use old greeting cards, or playing cards, or labels from food cans, seed packets. 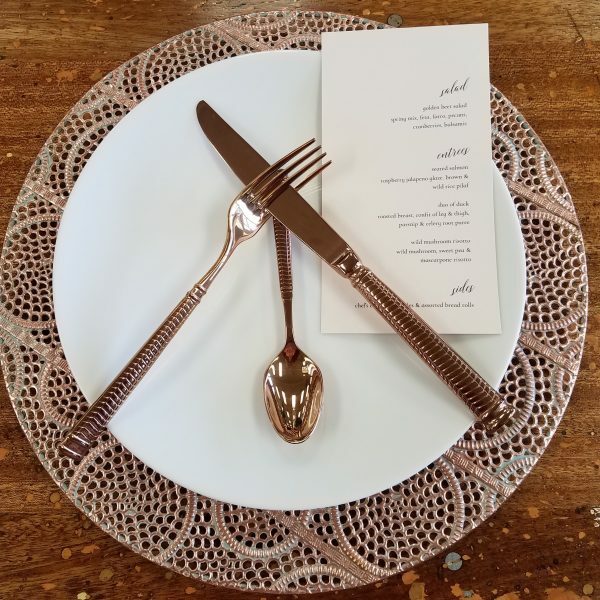 Consider using a rental dishes for a crowd, or for a new style. 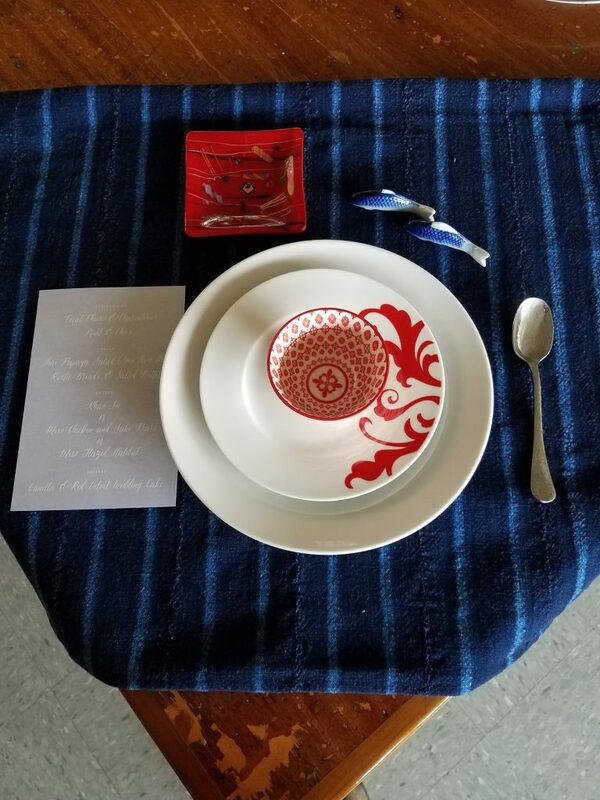 Rent a different set of flatware, or some chargers, or a fancy tablecloth. 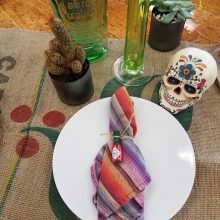 Places like thrift stores, Target, Pier 1 and World Markets can also be fun to pick up a set of salad plates, or fresh napkins, or even a fun drinking glass. That can lend a fun, fresh twist for a small amount of money. Previous Post: What is Sustainable Floristry?